Now, I doubt very much I’ll get in to report on our progress every day, but while I’m able I thought I’d keep you all updated on how my son and I are going. Today was a slow day for me. I got my word count: 1799 words to be exact, but the writing is still feeling sluggish. DS (Dear Son, for those unsure of what I mean), didn’t want to bother at all – until I reminded him of the awesome t-shirt he’ll be getting at the end, and offered him chocolate as incentive. More specifically, I said that whoever got to their word goal first, would get a row of chocolate. (I should note, that I never bribe my kids with chocolate, so that was a big thing). He won, easily, of course, having only 50 words in comparison to my 1667 word goal. *sigh* next time I will make the challenge harder. My biggest problem I think is that I am still editing as I go – damn inner editor – be gone!! DS got quite worried about proper spelling, stopped now and again to ask me how to spell something. I had the discussion with him about how November is a time for writing, not worrying about spelling and grammar (he may only be 6, but he’s almost better at it than I am lol), and that December is the time to fix all that stuff up. How’s your writing going? If you are participating in Nanowrimo – are you reaching your goals? Next postSix Sentence Sunday # 5 – Nano!! That’s so gorgeous Heather. Your son is putting in a great effort for a six year old! My NaNo’s going alright so far. However, I’ve been surfing the net for about an hour; really should have started earlier on the remaining 831 words I need to write in order to reach my word count for today. I’m off to make a dent on the word count now. Thanks Grateful! 🙂 I spent a lot of my time today surfing the net too – it was very important after all to study the eating habits of mermaids lol. 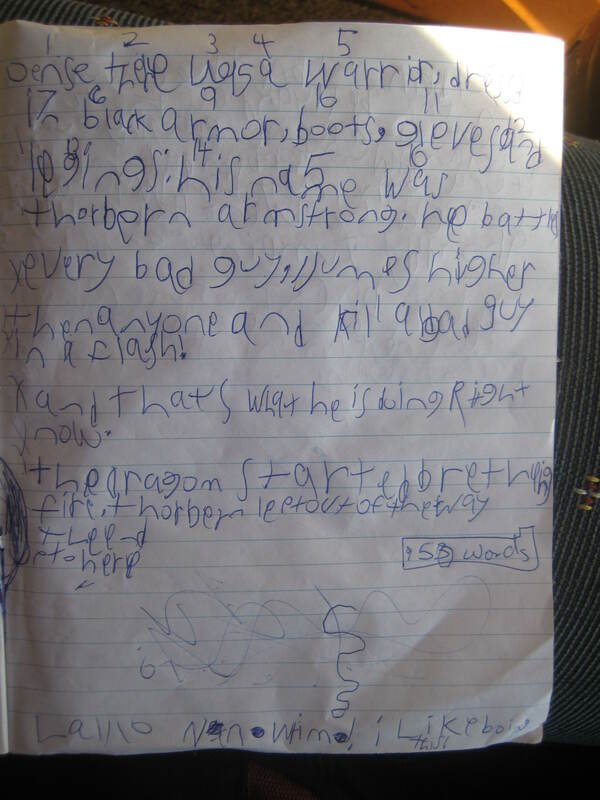 It looks like you have a little writer on your hands there well he is just like you. Lol! I’m sure my motivation would increase if I could be guaranteed of chocolate at the end of it… not feeling the motivation today!! Should really turn off wifi so I can’t access the internet – maybe that would help some lol.